Ahhh the 1980s. The golden era of action movies and video games...And of course the threat of dying in a thermonuclear blast. The 80s was a time of renewed tensions between East and West thanks to the election of Ronald Reagan to Washington who instigated the "Strategic Defence Initiative", a bold plan to essentially take World War III in to space. Taking inspiration from this, Sega developed the arcade game appropriately named "SDI: Strategic Defence Initiative" on the Sega-16 arcade system. 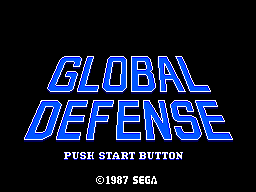 They then ported it to their Mark III console before shipping it overseas on to the equivalent Master System under the snazzy title "Global Defense". Rather than defending the God-loving, free world of the West from the Soviets, the player is instead defending all of humanity from an alien onslaught of missiles. One of the earlier releases, "Global Defense" stood out on the shelf at Toys'r'Us from the usual clip art style boxes with a colouful and relatively action packed box. Anyone who has never played this game before and only seen screenshots can be forgiven for thinking its a traditional horizontal shooter. However, it plays a little differently. Instead of a spaceship you actually control a military satellite in orbit around Earth tasked to blast the alien missiles as they swoop down on to our planet. 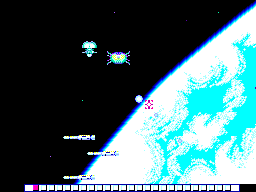 As such, you have to position your craft at the most advantageous point on the current screen and then use your weapons to blast the missiles. If you find your satellite is in danger then you have to reposition it but you can't fire while doing so. Each level is split in to two segments; an Offensive and a Defensive section. The Offensive section scrolls right slowly as you orbit Earth with the missiles passing horizontally. 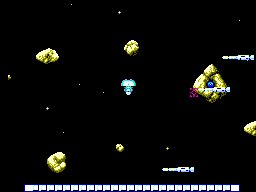 The Defensive section has you taking on waves of missiles swooping down from above your position. If you don't intercept enough missiles then you are treated to watching your loved ones in your home city being annihilated in a nuclear blast. At the end of each segment a space shuttle appears and recovers your satellite to take it to the next combat zone. Nothing groundbreaking or ugly for that matter. They are very early Master System and have something of a Commodore 64 feel to them (at least to me). The graphics do their job of showing you what is what so you don't really need anything else. Again very simplistic. Explosions are the usual distortions while the music throughout is high tempo but mostly comprised of pings and bongs. This is where the game really falls down for a lot of people. I have heard many make comparisons of the gameplay to Atari's "Missile Command" which is a game I honestly love but if you are expecting a fast paced, horizontal shooter then having to position your satellite does seem to slow the game down considerably. The D-pad controls the direction of your weapon not your satellite. In order to move your satellite you have to press Button 2 and then guide it with the D-pad. It takes some getting used to and can be problematic in some of the more hectic later levels. Button 1 fires. If you are having a Master System night and want a shooter with a difference then this is a good one to pull out. Other than that I can't say I play it very often but when I do pop it in I have a good time with it. I don't deliberately ignore it; let's say that at least. This game has a really bad rep online and I don't think its wholly deserved. More than anything, it doesn't just fall in to the background, getting lost with more traditional but unremarkable shooters on the console. My recommendation is give it a few tries before making your mind up. You may be pleasantly surprised. Collectors can find good boxed examples on Ebay for under £10.